Canterbury District Green Party: Canterbury Question Time. 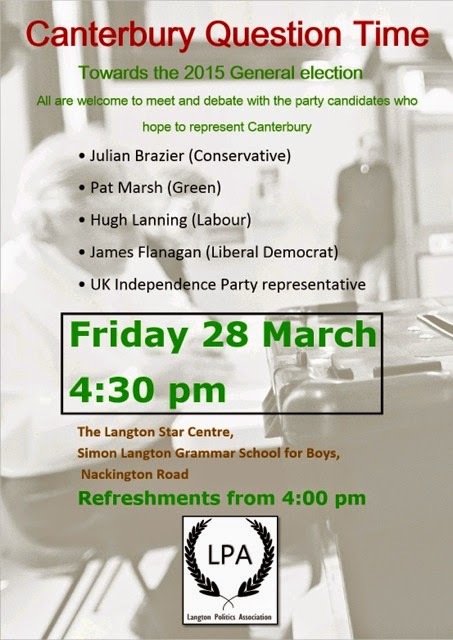 On Friday March 25th, Simon Langton Grammar School for Boys hosted a panel debate with the 5 party candidates who hope to represent Canterbury after the General Election in 2015. Pat Marsh gave an excellent account of Green Party principles at a 'question time' style panel at Canterbury's Simon Langton Boys School on 28th March. The panel was composed of five parliamentary candidates for next year's general election, one each from the five main parties, and was organised by the school's politics society. Gay Marriage, 'Fracking', Foreign Aid, Immigration, Council Tax Charges and the West's response to Russian military action in the Ukraine were the main subjects covered. Unfortunately for Julian Brazier (Conservative MP), he managed to isolate himself on the two subjects that most united the rest of the panel, fracking and gay marriage. He demonstrated how his conscience alienated him from the progressive views in his own party and on the rest of the panel, by attempting to explain why he was against Gay Marriage, while not being anti-gay. His views on fracking similarly led him into murky waters when, agreeing with the panel that it shouldn't take place in the Kent area (his own backyard), he called on us all to keep an open mind about the suitability of doing it elsewhere (someone else's backyard). In contrast, Pat provided an informed summary of the arguments against fracking - the controversial method of extracting shale gas from underground with the now well-publicised concerns about unavoidable outcomes, such as water contamination. She was equally confident on the subject of supporting current levels of Foreign Aid, mentioning the legacy of past generations in exploiting other parts of the world as one of the good reasons why we should not now scrimp in our continuing financial support of developing areas. This argument elicited a nationalistic outburst from one of the young men in the audience, who listed 'advances' Britain had given the world. Nobody else was moved to take this up. James Flanagan (Lib Dem) with his affable liberalism and Hugh Lanning (Labour) with his 'one-nation' socialism answered questions with ease, their input generally going down well with the audience. Not one to be left out, David Hirst (UKIP) gained fleeting popularity by resorting to comic brevity when his extreme views failed to win him friends.